This electronic preamplifier stands up to the test and will provide you with serious sound performance. The PP555 is perfect for bringing your studio equipment's phono-level output to a more suitable line-level output. 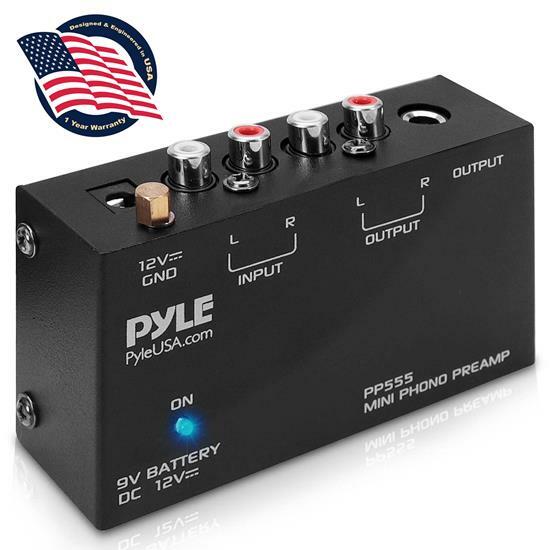 Compact preamp features include 9 Volt Battery Compartment, Dedicated RCA 1/4-Inch Output Connectors and power Adaptor. It'll take your audio signal, amplify its strength and prepare it for further processing by your studio equipment. Pre-amps technically provide voltage gain to your desired equipment and are key to assisting the signal source, whether it's a turntable, musical instrument or microphone. The ultra-low noise audio conditioning circuitry allows the pre-amp to boost audio to levels that are more manageable for various types of audio equipment. You'll find it easier to adjust the recording level volumes of different sources from microphones and instruments alike. You should position your preamp close to the source to reduce unwanted noise and interference. Pre-amps can sometimes come built into the stereo equipment, but if that's not the case, the PP555 is an easy install, wise choice and great addition to any musician or producer. Take your sounds and audio production skills to the next level with the PP555 Phono Turntable Preamplifier. PP999 is the newest - however they are still out of stocks - - customers will be notified through our website : pyleusa.com - -for updates. Hi, Do you have to turn it off when using 9 volt battery and it is not in use? yes preferably , so it will not drain your battery. take the screw out and pry with something thin. I hooked up the preamp and sound comes out of 1 speaker. Could the preamp be defected? check cables first, then try without pre-amp. If you get both speakers with low volume without pre-amp then yes return amp for a new one. Will this preamp work with a denon avr 1612 receiver and a pyle pro plttb-1 record player? The PP555 pre-amp is designed to plug any quality turntable into AUX in RCA port. High quality turntables with magnetic cartridges requires amplification of their signal to be at the same volume as the other sources you listen to through your stereo. This unit will work perfectly between your Pyle PLTTB1 and you Denon receiver.